Recently a friend asked me to “Venmo” her the money I owed her for theatre tickets. At first I thought it was some new slang that the Twittersphere came up with — but my friend told me all about how it was a convenient way to transfer money between friends. I’ve used one of Venmo’s competitors, Zelle, and I was curious about the difference between them, as well as good, old-fashioned PayPal. Zelle is a jointly owned service of seven of the country’s largest banks: Bank of America, BB&T, Capital One, JPMorgan Chase, PNC Bank, US Bank, and Wells Fargo. Zelle is bank-based, and works with your existing bank account. The limits for amount and frequency of transactions depends on which bank you use. Payments through Zelle cannot be cancelled. All that is needed to send money is the recipient’s email address or phone number. Money transfers in minutes between established Zelle account holders, but may take one to three business days for new account holders. Venmo is a product of PayPal. It has marketed itself as a convenient way to split checks at restaurants or other situations when no one has (or wants to carry) any cash. It’s unique because it is social; users upload photos to their profile, form networks, and keep up with their friends via a news feed. Link a credit card, debit card, or bank account. Transfers to and from bank accounts are free, but there is a 3% charge for debit cards. It takes one to three days to complete transfers, but Venmo transactions can be reversed. An upcoming feature will allow you to use Venmo to pay vendors directly. PayPal was started by Elon Musk of Tesla, SpaceX, and the Hyperloop. He famously started the company as an alternative to using credit cards over the internet for the purpose of increased security. Link a card or bank account. Transferring from PayPal account to PayPal account is instant and free. Transferring from your PayPal balance to a linked debit card is instant, but costs $.25. It takes up to five days to transfer from your bank account to your PayPal balance. A PayPal debit MasterCard is available, with no fees for ATMs inside 7-11 stores. 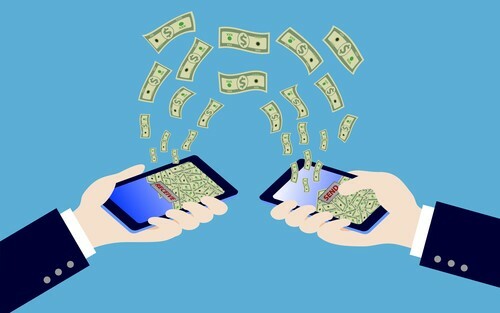 There’s already been fraud reported by people using Zelle and Venmo, but I think this new wave of banking by apps is a good thing in the long run. Start-up companies like PayPal have already spurred a certain degree of increased user friendliness in traditional banks. I hope this cheat sheet will help you understand the difference between these three big players in personal bank transfers.